Approximately 50 elephants are poached every day in Africa. This equates to one elephant every 28 minutes. 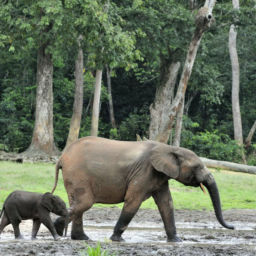 For forest elephants the figures are even more alarming. At least a couple of hundred thousand forest elephants were lost between 2002 – 2013 to the tune of at least sixty a day, or one every twenty minutes, day and night, according to Fiona Maisels, head of forest elephant study with WCS in 2014. Considering there are an estimated 45,000 forest elephants remaining, these figures are hugely worrying. The principal reason elephants are being slaughtered is due to the global demand for ivory, fuelled by high demand from the Asian markets, such as China. Although there is an international trade ban, some trade of ivory is still legal in the UK, including antique ivory produced before 1947. Recent evidence has revealed that the UK’s legal ivory market has been used as a cover for trade in illegal ivory and some shipments are destined for Asia. It is very difficult to distinguish between pre-1947 and post-1947 ivory meaning that ivory can be ‘laundered’ in the U.K market. Evidence broadcast by Hugh Fearnley-Whittingstall on the BBC (Saving Africa’s Elephants: Hugh and The Ivory War. ), confirmed that illegal ivory is being sold using the current exemptions, and that even recently-revised legislation is simply inadequate and does not prevent activities which continue to feed both domestic, European and global ivory markets. The Conservatives pledged to shut down the UK’s domestic ivory market in their manifesto for the past two elections. Despite approximately 30,000 African Elephants being slaughtered every year for their tusks yet, the government has still not outlawed the trade. 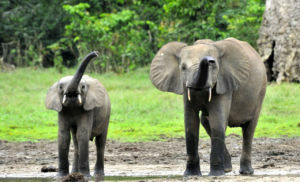 The African Forest Elephant Foundation supports a total ban on the trade of any ivory in the United Kingdom. A total ban would stop any contribution stimulating the global demand for ivory, which is one of the main drivers for the poaching of elephants. 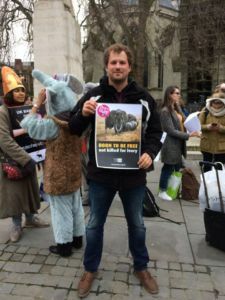 The African Forest Elephant Foundation was pleased to join Action for Elephants UK and Born Free Foundation and other members of the herd outside Westminster Hall while Parliament debated the ‘Shut down of domestic ivory market in the UK’. Read the debate the transcript on Hansard.parliament.uk. That being said, many were against a total ban, saying that the antique trade must be protected. Danny Kinahan, for example, provided economic arguments against a total ban arguing that the antiques trade in the UK is worth 13 billion GBP and will increase to 257 billion by 2025. Mr. Kinahan also argued that a total ban would rid us of some of the “most beautiful pieces“. However, in the UK alone, between 500 and 1,000 pieces of ivory are being sold every week. 31% of ivory exported from the EU comes from the UK. In 2015, there were 182 seizures of ivory, totalling 250 kg, by UK Border Force. In the programme mentioned above, Hugh Fearnley-Whittingstall selected several items that were promoted as antiques in online auctions across the UK and through carbon dating demonstrated that six of the nine pieces were actually illegal. Introducing the ban will deter those trying to traffic ivory, as the stricter legislation will deprive them of the opportunity to disguise new ivory as old. If nothing can be sold, nothing can be hidden. However “beautiful” ivory antiques may be is it worth risking, and contributing to, the extinction of one of the planets most majestic giants so that we may remember them with antiques? Securing a total ban on domestic ivory trade will not be enough to stop the continuous slaughtering of wild elephants. Governments around the world need to work together to stop the illegal ivory trade and corruption, as well as provide support to law enforcement and capacity on the ground. The illegal wildlife trade is considered the fourth largest illegal trade behind drugs, human trafficking and counterfeiting, worth around 12 billion annually, according to WWF. 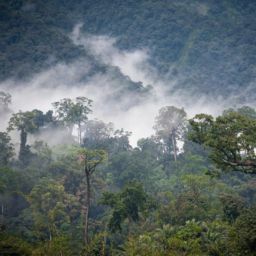 AFEF are working hard to protect the magnificent, yet fragile, forest elephants from illegal poaching and habitat loss, and human-elephant conflict across the Congo Basin. Read about Mission Minkebe to find out how AFEF are fundraising to support the rangers in the field who work tirelessly to protect forest elephants.